Alla is a longtime resident of Kirtland, Ohio. She has Bachelors degree in post secondary technical education and a Masters in Health Sciences. 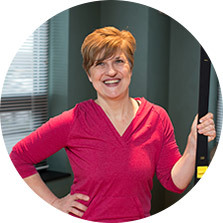 Alla is employed full-time as a Dental Hygienist and loves to teach fitness classes in her free time. Alla has her Level 1 and Level 2 Certification in TRX. In addition to TRX she enjoys the practice of yoga and loves to Zumba.